The Minicom by Tripplite Smart 0SU22082A is a single-user, 16-port analog KVM switch which gives you the ability to control multiple computers or servers from a single keyboard/ video/mouse console. The rack mountable, 1U-sized switch features innovative ROC (RICC on cable) dongle technology that directly connects you to each server in the rack, eliminating cable clutter and the need for multiple consoles. Question: Hello. I am interested in this product. Do you have it in stock? My residence is in Germany. Can you please let me know if you deliver to Germany and how long the delivery time would be? Thank you in advance. KVM Switches Online does ship to Germany, but there are certain requirements for international orders. First, there is $1000 minimum and a $100 fee. Prepayment via PayPal or wire transfer is required and both have additional fees associated. We also require the use of a 3rd party shipping account to bill all shipping charges, customs, duties and fees. 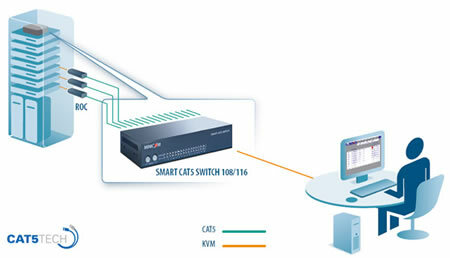 If you would like to proceed, please contact KVM Switches Online sales representative at 1-877-586-6654.